It was a very glitzy occasion when young Hillsborough woman Katharine Walker stepped out onto the stage at Belfast's Europa Hotel to accept her Insanity Tan Miss Northern Ireland 2018 crown on Monday evening - and certainly a world away from her role as a children's nurse at the Royal Victoria Hospital for Sick Children. In place of her regulation NHS uniform, pared back make-up and neatly tied-back hair, Katharine dazzled in a beautiful, embellished floor-length cream-coloured gown which contrasted magnificently with her bronzed skin. As her winner's crown was placed upon her blonde hair, which had been stylishly teased into long flowing waves, tears of joy fell from her eyes without - thankfully - causing her expertly applied mascara to run. At 5ft 7in, slim and undeniably beautiful, the 23-year-old Queen's University graduate wouldn't have looked out of place on the Hollywood red carpet. But, of course, the high glamour world of beauty contests is a very different environment to the day-to-day life she is used to on the hospital wards, where she has been working for almost two years in the paediatric intensive care unit. That said, it would appear she has no immediate plans to walk away from her hospital career, instead hoping that she can juggle both roles. "I've been at the hospital since October 2016 after graduating," says Katharine. "I'm working with extremely sick children, some with complex needs. It's a lot of shift work and lots of hard work but I really do love it. "It's a tough job but so worthwhile. When you have those moments when you see a child ready to leave and go back to their parents, it's incredible." If the froth and fun of the catwalk can seem a frivolous world, it's clear that Katharine is a serious-minded young woman, who has gleaned considerable life experience from her profession. While it is fulfilling to nurse a child back to health, evidently there are deeply upsetting occasions when a happy ending looks unlikely. "But then you realise that it's the families who are going through it in a way that you are not, and they're the ones that are being positive, despite everything they're facing. That puts things into perspective." Katharine grew up in Hillsborough, Co Down. Her dad Fred was a civil servant and mum Wendy self-employed, but both are now retired. Katharine could now be forgiven if she wanted to hang up her hospital uniform for the time being in order to pursue all the opportunities that being Miss NI will afford her. These include being on the books with ACA Models and attending high-profile events like the Irish Open. But Katharine reveals that she has no immediate plans to quit her job at the hospital. "I'm going to do my best to balance things as much as I can," she says. "I'm going to figure out my shifts, I don't want to lose that connection." And while she's wearing her Miss NI Crown, she will be raising the profile of the NI Children's Hospice, which has a long association with the beauty contest as its chosen charity. It's a connection that she is keen to build on. "Unless you've actually worked with the hospice, or had a family member there, then it's very hard to fully understand all the work they do. So my drive is to push the hospice, to ensure that their cause is heard. I'd love to make doing something for others my main focus," she says. Like a lot of her peers, Katharine is aware of the social media pressures endured by women. In the #MeToo era, she also needs little reminding that beauty pageants globally are coming under increasing scrutiny from feminists. Undeterred, Katharine is keen to stress that the Miss NI contest is forward-looking. "Every year the competition adapts," she says, citing the contest's ethos of 'Beauty with Purpose'. It's so much more than a beauty contest, it's much more about what you do off the stage. It's updating, it's staying relevant. I have friends who realise now that it's about much more than standing on a stage and having your picture taken, there is substance to it. "For me, it has been a very positive experience. I'm all for female empowerment, but I'm not about bashing men. I believe in an even playing field and I believe in equality in all senses. "I think beauty contests can be one of those things that people have negative ideas about and tend to be quick to judge, but the girls want to be there, they're not being forced into it. "And the girls have so much to offer and there's so much depth to them. At the end of the day, it's a beauty pageant, but it's so much more than that." A poem she had written and which she says she nervously read out during the final expressed that very sentiment, and Katharine - who attended Friends Grammar School in Lisburn before studying for her children's nursing degree - cites women like Emma Watson and Blake Lively as among the female public figures she respects. "They're stunning, but in a really natural way. They've come from ordinary backgrounds and they're not afraid to go against the grain," she says. Currently single ("I'm a strong, independent woman," she laughs), Katharine herself wants to be open about the pressures she faces on a daily basis to be 'perfect'. "I'm just a normal girl," she says. "You don't have to be glam all the time and I'm really not at 3 o'clock when I've finished a shift. You don't have to be girly either. Away from Miss NI, I'm sporty and play hockey and tennis. Nor do you have to be prim and proper." Indeed, she reveals that while still at school she took a knock on the sports pitch that also knocked her self-confidence. "When I was 16 I was playing hockey when a ball hit me in the face and knocked out two of my teeth," she recalls. "It meant months of dental visits and it just really affected my confidence for a time. "Afterwards, when I went back onto the hockey field, it was never the same experience. It spooked me on the field and I was afraid of being hit again." It didn't deter her, however, from playing for Queen's while she was a student and she still finds time to visit Downshire Tennis Club, close to her home, to hit the tennis courts. Away from the sporting arena, the Miss NI title was, however, a long-cherished goal of hers. She had entered for the first time in 2017 and finished in the top 10. "I did win Miss Personality, which is very special to me, as it was the other girls who voted me for it," she reveals. Katharine had such a great experience, though, that she wanted to have another go again this year. She won the title of Miss Horatio Todd's during the heats, and then this week came that moment under the spotlights when the crown was passed to her from last year's winner, Anna Henry, whom she shared the stage with in 2017. So now that she's finally achieved her dream 12 months later, how does she feel? "I'm so thrilled, it hasn't sunk in yet. I've been following Miss NI for as long as I can remember. Miss NI is so special to me." 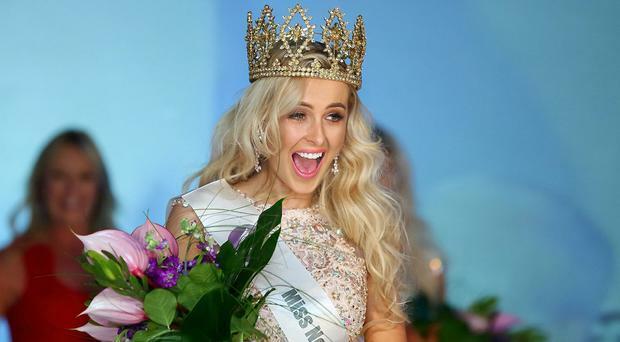 Plans to relocate to Australia for a year to work in a Melbourne hospital have been put on hold as her reign as Miss NI will stretch into next year. As well as a modelling contract and gifts, including a year's supply of beauty treatments, a bespoke personal training package and the use of a car for a year, Katharine has the Miss World final to attend this autumn. "I'm already nervous about it but I can wait to get out there and represent Northern Ireland, and show them what we're about," she adds. The demands of the role will mean a lot of juggling her time, but Katharine says she's ready to take on the challenge. In fact, along with winning the Miss NI title, she says that she is most proud of her ability to just get on with it and multi-task when she has to. "In the past I had a part-time job, I was studying, learning and getting my degree on top of it all. I'm so proud that I managed it. I look back now and I think, 'How did I do it all?'" Yet for all of her success, both as Miss NI and in her career, Katharine remains rather charmingly self-deprecating. "I'm just a normal girl," she adds. "I'm approachable and down-to-earth. Everything I've had, I've worked for it."